Last night I decided to brave Times Square and TKTS to see what show I might enjoy. For the committment of just an hour of waiting in line, I had the choice of just about everything on Broadway —Mary Poppins, Shrek, Grease, Spamalot, Phantom of the Opera, even the Christmas Spectacular at Radio City Music Hall--and off-Broadway too for 50% of face value. 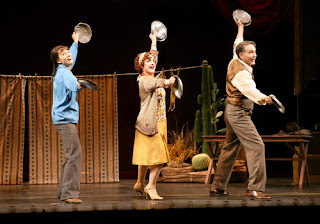 Though I was interested in Young Frankenstein and Equus, I opted instead for the revival of Gypsy starring the incomparable Patti LuPone as Mama Rose. 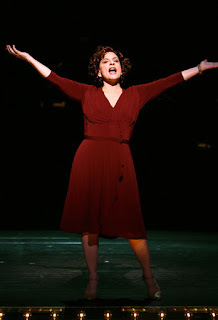 I had not seen Gypsy before last night, and to be honest, if not for Ms. LuPone, I probably never would have. It is based on the memoirs of Gypsy Rose Lee, the burlesque dancer and stripper, actor and author dominated American stages during the 30s and 40s. The story revolves ultimately around Louise (Gypsy's real name), her sister June, and their mother Rose, whose only desire is to make June a star on the vaudeville circuit. Ultimately, June marries and leaves the act, but June is not talented enough to carry on the act, but she does discover a talent for burlesque, putting the tease in strip tease, she became a major star. Gypsy is not really about its title character, but instead her mother. Mama Rose is the very worst example of a stage mother, insisting that her kids have talent greater than has ever been se en before, living her own dreams vicariously through her daughters. Patti LuPone plays this to perfection; she is neurotic and overbearing, mercurial in her moods and unwilling to ever settle for anything less than her dream, and that dream is ever changing. She willingly allows Louise to strip, but when Gypsy becomes the best paid stripper in the whole world, Mama Rose continues to berate her daughter for not being the right kind of star. There is a reason why this production of Gypsy won three Tony Awards last year, pure, out of this world talent, lead by Best Actress Tony winner Patti LuPone. She is possibly the greatest musical theatre actress of her generation. Her voice is pure and strong, and she infuses it with such emotion that she truly inhabits the roles she plays. I first saw Ms. LuPone on Broadway in Sweeney Todd in 2006 where she played Mrs. Lovett. She excels at Sondheim's complicated lyrics and powerful but unrefined women who are haunted by demons. In the Gypsy finale, "Rose's Turn," LuPone lets loose with a manic performance to remind everyone why we go to live theatre. She was magnificent, and now I can't wait to see her again. In addition to LuPone are Best Supporting Actor Tony winner Boyd Gaines as Herbie, the hapless agent Mama Rose seduces to book venues for act, and Best Support Actress Tony winner Laura Benanti who plays Louise aka Gypsy Rose Lee. Both are admirable foils for LuPone's Mama Rose. In "Together Wherever We Go," the trio of Tony winners demonstrate the chemistry that has made this revival such a wonder. The draw of Gypsy is the rollercoaster ride of emotions that rush from light-hearted and hysterical to poignant and heartrending. My favorite number, besides the classics, is "You Gotta Get a Gimmick" with the three over-the-hill burlesque dancers. I had tears in my eyes from laughing so hard. Gypsy is scheduled through March 2009 at the St. James theatre in New York. Get out to see it before it is gone! You will not be disappointed.